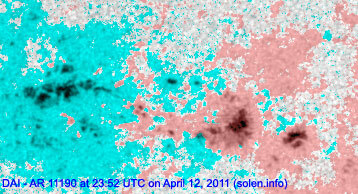 The geomagnetic field was quiet to active on April 13. 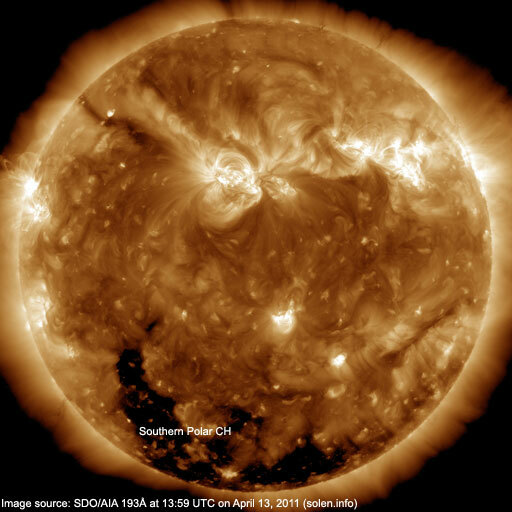 Solar wind speed ranged between 470 and 611 km/s under the influence of a high speed stream originating from an extension of the southern polar coronal hole. 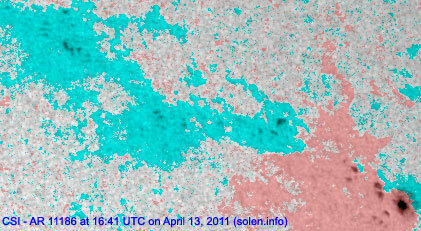 Solar flux estimated at 20h UTC on 2.8 GHz was 117.8 (increasing 27.7 over the last solar rotation). The planetary A index was 14 (STAR Ap - based on the mean of three hour interval ap indices: 14.0). 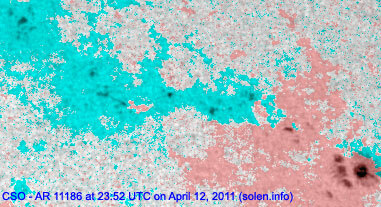 Three hour interval K indices: 43432321 (planetary), 43433211 (Boulder). 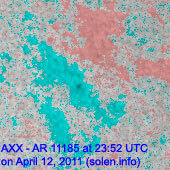 Region 11186 didn't change significantly and was quiet. 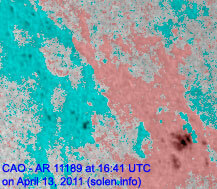 Region 11190 developed moderately quickly and has become a fairly compact region with polarity intermixing. 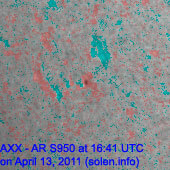 C flares are likely and there's an increasing chance of an M class flare. 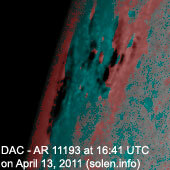 Flare: C1.1 at 16:07 UTC. Region 11191 added a few trailing spots. 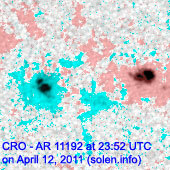 Flares: C1.9 at 03:30, C1.2 at 07:59 UTC. 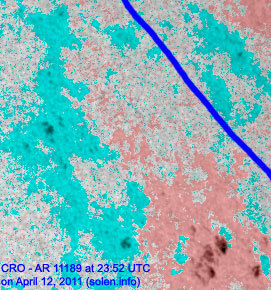 Region 11192 was mostly unchanged and quiet. 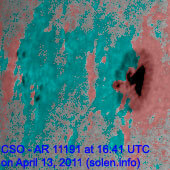 New region 11193 began to rotate into view at the northeast limb late on April 12 and was numbered the next day by NOAA/SWPC. 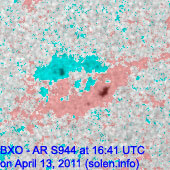 This is a complex and compact region capable of producing M flares. 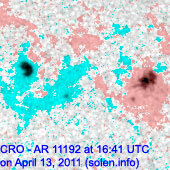 Flares: C2.2/1F at 06:28 and C2.5 at 13:43 UTC. 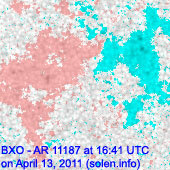 Comment added at 19:30 UTC on April 14: Region 11190 has developed quickly today and now has an EKC classification. 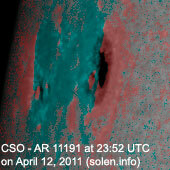 A magnetic delta structure has formed in a central penumbra and M flares are becoming likely. 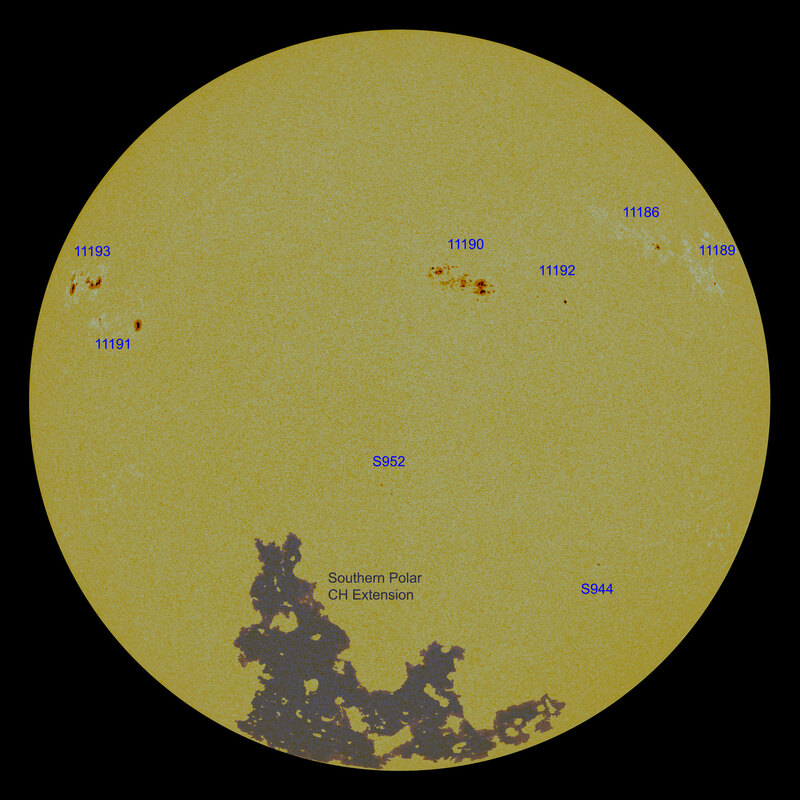 Region 11193 has large spots as well and an EKC classification. 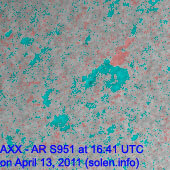 The latest STAR CHARMAP (without polarities). 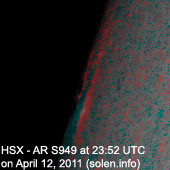 April 11-13: No obviously Earth directed CMEs were observed in LASCO and STEREO imagery. 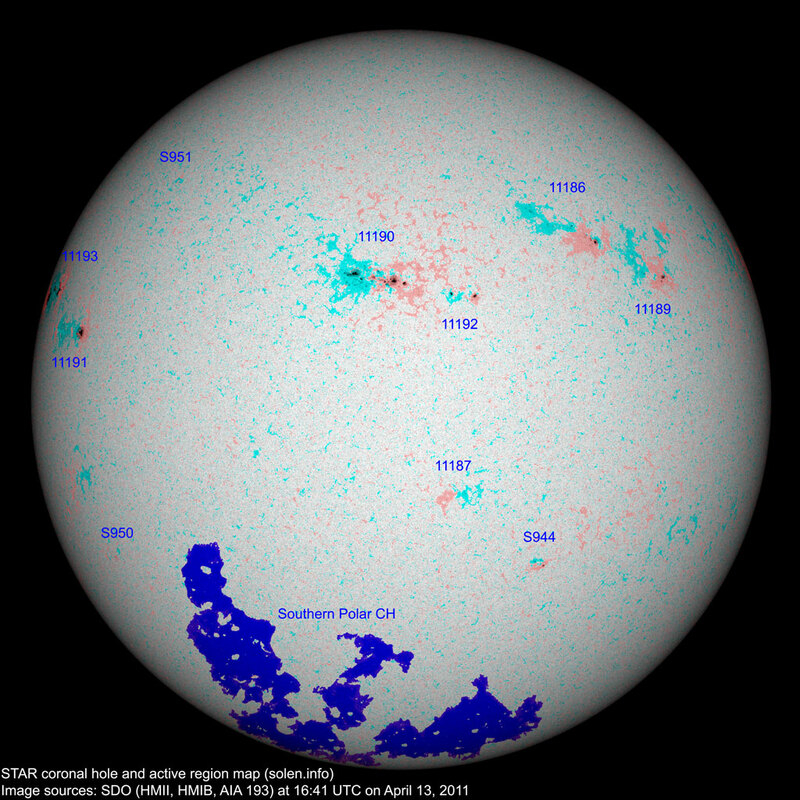 The geomagnetic field is expected to be mostly quiet on April 14-16.